College Football Playoff National Championship on ESPN Delivers Largest Audience in Cable History; ESPN Streaming Record for non-World Cup Programming - ESPN Press Room U.S.
ESPN’s Monday night telecast of the inaugural College Football Playoff National Championship Presented by AT&T — Ohio State’s 42-20 victory over Oregon at AT&T Stadium in Arlington, Texas – averaged 33,395,000 viewers and an 18.2 US household rating, according to Nielsen, delivering both the largest audience and highest rating in cable television history. The College Football Playoff National Championship generated a 31 percent increase in viewership and a 26 percent increase in rating over the 2014 BCS National Championship: Auburn vs. Florida State (25,572,000 viewers & 14.4 rating). Additionally, the Buckeyes’ victory resulted in a 22 percent increase in audience and 19 percent gain in rating over the 2011 BCS Championship featuring Oregon vs. Auburn (27,316,000 viewers and 15.3 rating) which had ranked as the most-watched and highest-rated program in cable history before the new College Football Playoff debuted. In the primary home markets of the two schools, the telecast delivered a 51.2 in Columbus, the No. 1 overall market, and a 37.6 in Portland, fourth overall. The top 10 metered markets (in addition to those of the competing teams) are the following: Columbus, Dayton (43.8), Cleveland (41.3), Portland, Birmingham (36.1), Cincinnati (26.5), Jacksonville (25.7), Knoxville (25.5), Greenville (24.1) and Atlanta (23.0). In all, the National Championship set overnight post season college football records in 22 metered markets: Cincinnati, Cleveland, Columbus, Dallas, Dayton, Denver, Ft. Myers, Las Vegas, Los Angeles, Minneapolis, New York, Norfolk, Philadelphia, Portland, Raleigh-Durham, Richmond, Sacramento, Salt Lake City, San Antonio, San Francisco, Seattle and Washington, D.C. The simulcast of ESPN’s main telecast of the College Football Playoff National Championship on WatchESPN attracted 1,161,000 unique viewers, 82,000,000 minutes viewed and average minute audience of 366,000. The usage represents an increase of 110 percent (553,000 unique viewers), 144 percent (33,600,000 minutes viewed), and 128 percent (160,000 average audience), respectively, over the 2014 BCS National Championship. The CFP National Championship now stands as the best college football game ever on WatchESPN based on unique viewers, minutes viewed, and an average minute audience surpassing this year’s Sugar Bowl (912,000 unique viewers, 58.7 million minutes viewed, and an average minute audience of 256,000). It also ranks as the best non-World Cup event ever on WatchESPN. Beyond the traditional telecast, ESPN offered more than 12 ways to watch last night’s championship game through the “CFP Megacast.” Collectively, ESPN2, ESPNU, ESPN Deportes and ESPNEWS, along with ESPN, combined to average 34,148,000 viewers and an 18.6 US household rating. 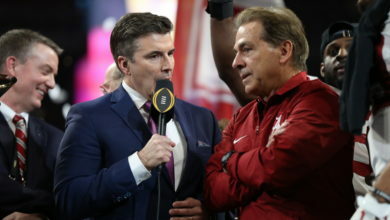 This year’s “Megacast” increased viewership and ratings by 30 percent and 26 percent, respectively, over the 2014 BCS National Championship Megacast – the first multi-network telecast of this kind, which attracted 26,205,000 viewers and a 14.8 rating. Note: Television ratings for ESPN Classic, and ESPN Goal Line, which were part of the CFP Megacast, are not available. The “CFP Megacast” on WatchESPN, which included five unique variations on ESPN3 in addition to the networks’ simulcasts – combined to attract 1,406,000 unique viewers, 106,300,000 minutes viewed and average minute audience of 475,000. The usage represents an increase of 82 percent (773,000 unique viewers), 101 percent (52,900,000 minutes viewed) and 88 percent, (252,000 average audience), respectively, over the 2014 BCS National Championship Megacast. An estimated 62,900 listeners tuned in on average to the National Championship game on the ESPN Audio Streaming Network, a projected increase of 86% from last year’s BCS National Championship. ESPN was the most-watched cable network in primetime in 2014. The network followed up that milestone with its most-viewed week ever (Monday, Dec. 29, 2014 – Sunday, Jan. 4, 2015). ESPN has now televised the Top 3, and four of the Top 9, most-watched programs in cable history over the past 11 days, while claiming every telecast in cable’s all-time Top 20 (chart below). Please Note: ESPN’s USA-Portugal telecast from the 2014 FIFA World Cup achieved an average audience of 18,200,000 for the game window. However, following official Nielsen records, this game would not qualify for top 20 cable telecasts all-time because the Nielsen window for the telecast includes the pre-match show.